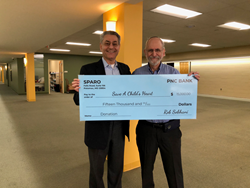 Sparo Corporation, developer of the Sparo community giving platform, an early stage technology platform to make charitable giving fun and easy, announced today that it has secured a $15,000 donation for Save A Child's Heart. These funds will be used to transport a child from Gaza to Israel to treat them with a life-saving heart operation. "Our business is all about making donations easy, so what better way to launch our mission than with a donation of our own,” said Rob Sobhani, founder and CEO of Sparo. “Through our extensive global network, we were able to secure this donation on behalf of Save a Child’s Heart, which is helping us test our new platform. It is our hope that through our work we can increase charitable giving around the world." The company aims to make it easy for donors to discover new charities that need their help and will conduct frequent sweepstakes whereby a participating charity is randomly selected to win the pot. Frequent donors will win gift cards or other prizes. The platform runs online and is currently being beta tested by Save a Child’s Heart along with the Omid Foundation and the Maryland Food Bank. In 2016, Sparo was issued several patents for the gamification of charitable giving. The company is now in a soft launch phase of its Sparo platform. For more information on the platform, visit https://www.SparoPrize.com. The Sparo community giving platform was founded in 2018 to democratize global charitable giving, as a spinoff off of Sparo Corporation’s e-commerce platform founded in 2014 by noted author and foreign policy expert turned entrepreneur Rob Sobhani, Ph.D. Through its patented Sparo community giving platform and Sparo sweepstakes, Sparo aims to make it fun and easy to donate to worthy not-for-profits. Sparo operates globally and is based in the Washington, DC Metro area.